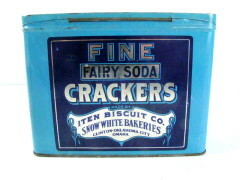 Circa 1920, Uneeda Soda Cracker Tin Box by National Biscuit Co. 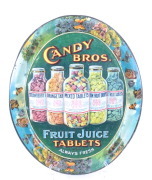 This is a brightly colored red and blue tin box that helped keep soda crackers fresh. 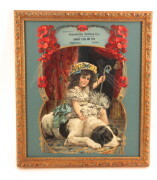 National Biscuit Co. (now Nabisco) was one of the first companies to mass-produce and package their baked products. 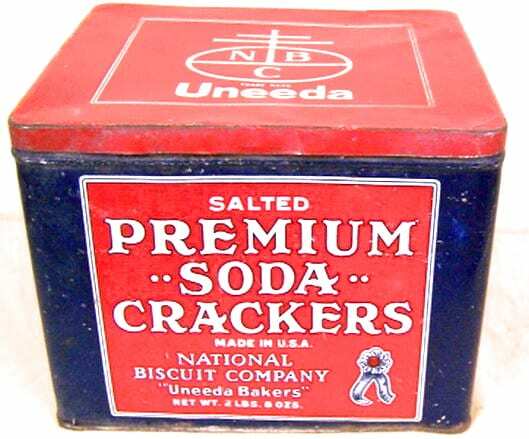 In the 1920′s, the company introduced this packaged biscuit called Uneeda and put them in tin boxes with the “in-er-seal” waxed paper lining. Uneeda became one of the most commonly used word sat the time due to its popularity. 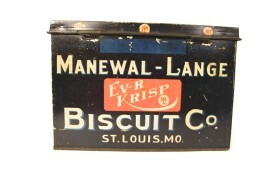 Other companies imitated the Uneeda brand with names such as “Ulika”, ”Uwanta” and “Iwanta” Biscuit brands. 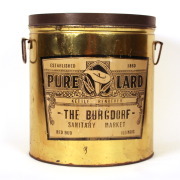 However, National Biscuit Co. sued the others and they put a stop to more than 200 cases of copyright infringement with these competitive bakeries.